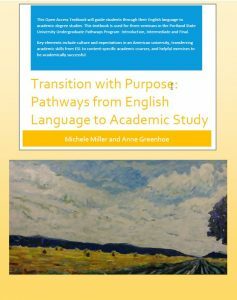 Portland State University Library is pleased to announce the publication of a new open textbook, Transition with Purpose: Pathways from English Language to Academic Study, by Michele Miller and Anne Greenhoe. This open access textbook will guide students through their English language to academic degree studies. The textbook is used for three seminars in the Portland State University Undergraduate Pathways Program for English language learners. Part one of this textbook is a guide for moving from ESL study to academic study at Portland State University. * It includes the resources students will use to understand policies and processes governing their degree study and their transition to academic coursework. Part two focuses on how academic skills are used across various disciplines and is comprised of activities and assignments designed to practice these skills. Key elements include culture and expectations in an American university, transferring academic skills from ESL to content-specific academic courses, and helpful exercises to be academically successful. The book is the work of Michele Miller, Academic Advisor, Intensive English Language Program and Anne Greenhoe, Instructor, Intensive English Language Program. Transition with Purpose is licensed with a Creative Commons Attribution-NonCommercial 4.0 International License. Portland State University Library publishes open textbooks through PDXOpen, an open access textbook publishing initiative. The Library works with Portland State University faculty authors to publish high-quality open access textbooks designed specifically for their courses. These books are free to students at Portland State and to anyone in the world. PDXOpen textbooks are available in PDXScholar. *While much of the content of this book relates specifically to Portland State University, it is the hope of the authors that the structure of the text and the activities within it may inspire adaptations to fit the needs of other colleges and universities.